Beginning with the *ill-fated Maytag Neptune washer launched in 1997, Maytag followed with a steady stream of innovative products into the early part of the following decade. All of these appliances were based on interesting and I'd say clever concepts. They included the Wide-by-Side Refrigerator, the Gemini Double Oven Range, the 3-Rack Dishwasher, and the Drying Cabinet. Only one of them took hold. Clearly the most successful of these innovations, and the one that still exists today is the Double Oven Range. It is certainly my favorite and something that I purchased for my new home in 1999, a year before I went to work for Maytag. (Full disclosure. I worked for Maytag's builder division 200-2004, then moved to their Jenn-Air division where I stayed through 2011. Maytag was purchase by Whilrpool in 2006). a: having two ovens in a single appliance so that they could simultaneously cook different foods at different temperatures, for different periods. b: not needing to heat up the big oven when they only wanted to prepare something small, reheat, toast, broil, etc. The Gemini range did a nice job of toasting, so we kept our countertop uncluttered since we needed neither a toaster nor toaster oven. We had the ability to cook in both of the Gemini ovens at the same time, but that really happened only during holidays. We used the small upper oven for our daily needs and used the lower oven for occasional baking. Living in Arizona, we appreciated being able to use the small oven and not heat up the kitchen. We were able to cook small roasts, chickens, etc. in the upper oven. My wife absolutely loved it, and still misses the convenience. (We moved in 2005, and left our Gemini behind). 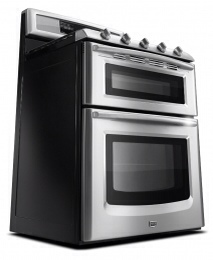 Today, all major brands have some version of a double oven range in their lineup. Next up – What appliances are no longer around that you'd like to see brought back? *It's hard to write Neptune Washer without preceding it with the words “ill-fated”. However, even though Neptune performance problems led to a class action lawsuit, the Neptune washer helped change the industry. Neptune was the first full-sized front load washer in the U.S. Whirlpool's Duet soon followed. Today we have a much different appliance industry because of the full-sized front loading washer. This entry was posted in Appliances and tagged 3 rack dishwasher, double oven range, drying cabinet, Gemini, innovation, intuitive innovation, Maytag, Neptune, Wide-by-Side refrigerator. Bookmark the permalink. What do you get when you cross innovation with disruptive technology in the home laundry area? I only worked for Maytag and Whirlpool for a short period but I have been in cleaning all my life. The time for minimizing water, waste, energy and chemicals is coming for home laundry. I was Manager of Materials Development at Maytag and I am working on a project to use green solvents (if spilled on the grass, the grass grows better!) in a close-looped process to eliminate 20-40 gallons of mostly detergent and some dirt from hittling our waste streams in a non-green process. Using greener detergents by the detergent manufacturers still allows the wasteful dumping of millions (billions) of gallons of drinkable water. We are already being considered for a $ 50 K grant by the Chinese. Whirlpool has been aware of these efforts in the past. I am a Scientist (Chemist) who is looking to form a Strategic Alliance with equipment, green solvent, and detergent manufacturers. We have a provisional patent and will also manufacturer a key co-solvent for the cleaning formulation. This project aids in the conservation of water and provides cleaning for those without access to clean water. It represents an improvement in the dry cleaning industry but a disruptive technology for home use. The solvent is recycled and recovered. No dryer is necessary. The new washing machine would be larger than existing machines but smaller than a typical washer/dryer combination. Clothing will last longer, smell fresh and be clean. Let me know if you would like to know more. We are in the early stages of development. Thanks.